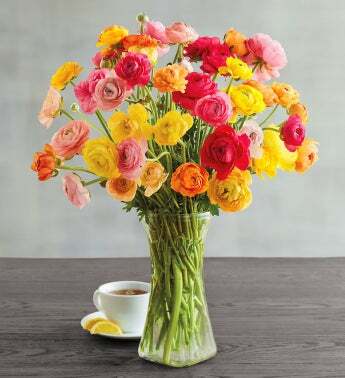 This is a unique fresh cut flower bouquet of a variety of ranunculus flowers. Ranunculus are blooming bulbs that are known for their remarkable amount of petals. Each flower has rows and rows of paper thin petals, giving them a roselike appearance. Send this bouquet to brighten up someone's big day. Or normal day. Getting a beautiful bunch of fresh flowers is always a nice thing. And this one comes in a pretty glass vase, too.